Late last week the petition to stop article 13 rose past 5 million signatures. This major milestone was achieved weeks after it became the single most popular petition ever. Yesterday, we brought you news of how the March 23 day of action protests turned out. It seems people hit the streets in droves as protests all over Europe broke out. Whole highways shut down as protesters streamed through the streets. Entire squares filled with people. Chants are heard everywhere. Everyone with one united goal: to put a stop to the copyright directive. At this stage, the outcome of this next vote is uncertain. Still, it seems free speech supporters have the momentum. With the people of Europe already expressing their very vocal opposition towards the directive, things will now focus more and more on the political realm in the final lead up to the vote. At this point in time, there is already a campaign to have MEPs make a pledge to vote down the directive. For it’s part, Pledge2019 says that they have already received the support of 126 MEPs. Currently, their goal is to reach 150 MEP’s. So, they are already getting close to their current goal. Free speech supporters are no doubt urging fellow citizens to find out if their representative supports free speech through this directive. If not, then they are likely hoping that those people tell their representative to take the pledge or give an indication as to whether or not they support free speech. With the vote happening on the 27th, time is definitely running out. 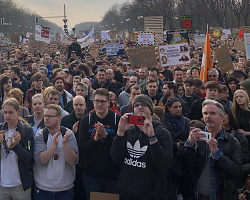 One final note is that if the copyright directive still passes in spite of the unprecedented protests, there is still one last vote coming up next month. So, while it is not yet do or die time, we aren’t that far off at this point. The sooner advocates kill this legislation off, the better.